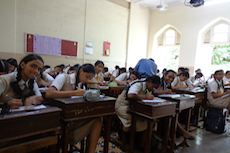 The School prepares students for the Secondary School Certificate Exam conducted at the end of Standard X by the Maharashtra State Board of Secondary Education, Mumbai Divisional Board, Mumbai. In accordance with the School’s motto “Forward God Helping”, the School endeavours to lead the students to progress in the Love and Fear of God. Its special care extended to the learning disabled, slow learners, physically handicapped. Exposure to national and international issues of importance which helps to further learning and honing of values. 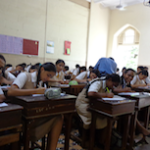 SJC also prepares students for the NIOS. This is an autonomous organisation of the Department of Education, Ministry of Human Resource Development, Government of India, New Delhi. It acts as a National Board of Examinations in Open Schooling. It is the largest open school system in the world. School: Monday – Friday 8.40 a.m. to 12.25 p.m. 1.20 p.m. to 3.30 p.m.
School Office: Monday – Friday 9.00 a.m. to 11.30 a.m.
Headmistress: Tuesday / Thursday 9.35 a.m. to 11.0 a.m.